"Rumi, the Persian language mystic poet, was the inspiration behind Khalili’s work for his wisdom concerning humanity and the elements of Earth, Water, Air, and Fire." 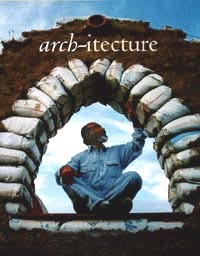 Nader Khalili (1936-2008) is the world-renowned Iranian-American architect, author, humanitarian, teacher, and innovator of the Geltaftan Earth-and-Fire system known as Ceramic Houses, and of the Superadobe construction system. Khalili received his philosophy and architectural education in Iran, Turkey, and the United States. In 1984, Lunar and Space habitation became an integral part of his work. He presented his “Magma Structures” design, based on Geltaftan System, and “Velcro-Adobe” system (later to become Superadobe) at the 1984 NASA symposium, “Lunar Bases and Space Activities of the 21st Century.” He was subsequently invited to Los Alamos National Laboratory as a visiting scientist. Starting in 1984, he presented papers and was published in several symposiums and publications including those of NASA, and the “Journal of Aerospace Engineering” for which he was awarded by the American Society of Civil Engineers. Khalili was a member of the team of “Lunar Resources Processing Project,” along with the Princeton based Space Studies Institute, McDonnell Douglas Space Systems, and Alcoa. Khalili was the founder and director of the Geltaftan Foundation (1986), and the California Institute of Earth Art and Architecture (Cal-Earth) (1991). At Cal-Earth. Khalili taught his philosophy and earth architecture techniques. His sustainable solutions to human shelter have been published by NASA, and awarded by the United Nations, and the Aga Khan award for Architecture, among others. At Cal-Earth, prototypes were built and tested for inclusion in the Uniform Building Code. His six books were written while evolving these techniques and his philosophy of architecture. He wrote Racing Alone and Ceramic Houses and Earth Architecture: How to Build Your Own while developing the Geltaftan “Earth and Fire” system for building Ceramic houses; Sidewalks on the Moon while designing for the moon, a journey through tradition and technology; and Emergency Sandbag Shelter and Eco-Village: How to Build Your Own, which recorded the building techniques researched and developed at Cal-Earth. Rumi, the Persian language mystic poet, was the inspiration behind Khalili’s work for his wisdom concerning humanity and the elements of Earth, Water, Air, and Fire. Khalili translated Rumi’s work in Rumi, Fountain of Fire translations of 75 poems, and Rumi, Dancing the Flame 300 Rubayiat poems. Khalili’s “Works and Words” have been widely exhibited and published in the U.S. and at international institutions including the Centre Georges Pompidou in Paris and the Institute of American Indian Arts Museum in Santa Fe, New Mexico; and broadcast on national and statewide TV channels such as the BBC World Service and Voice of America. Over 100 hands-on workshops and lectures were conducted in the U.S. and abroad, from Princeton University and MIT to inmates of Chino and other prisons, from NASA and Los Alamos National Laboratory to many Native American Reservations, and from children in South Central Los Angeles hospitals to the Universities of California, as well as other national and international universities. Khalili’s architectural works also include: the design of a future-oriented community for 5,000 inhabitants for Future City/ Villages, Intl. in New Cuyama, California in 1988 (prototype built on-site, and pre-fabricated vault modules were built, fired, and glazed at a brick factory); Malekshahr of Isfahan, a community for 20,000, which was designed and partially constructed in 1979; the Middle East headquarters of Dupont/Polyacryl was designed and supervised, completed in 1978; as well as over 100 projects of conventional buildings ranging from high-rise to single residence. Khalili passed away at the age of 72 on Wednesday, March 5, 2008. Born in Iran as one of nine children, his quest was to empower the world’s poor and refugees to build homes using the earth under their feet. Khalili’s son Dastan, and daughter Sheefteh, are now working to carry forward his vision and quest throughout the world. He was a prominent American leader on the value of ethically based architecture, where the needs of the homeless are considered above all else. The world's focus on Global Warming with its unpredictable future is happening while the world is trying to recuperate from the catastrophic central Asian Earthquake as well as the Asian Tsunami, which also happened on the anniversary of the great Bam earthquake in Iran. Tens of thousands have lost their lives — most communities wiped out in a matter of minutes or hours. The hurricanes on the South Coast of the United States have created an unprecedented disaster requiring great cost and effort to deal with. Added to this are the Central American hurricanes, refugees in Darfur, as well as continuous victims of AIDS who leave behind huge numbers of homeless orphans. Emergency help has been rushing and criss-crossing the globe to find survivors — doctoring, feeding, crowding them into temporary shelters and relocating them. There are not enough tents in the world to shelter the latest Central Asian earthquake victims who are facing more disaster from the winter freeze and winds. The greatest costs of rebuilding after the disasters goes to the infrastructure and human shelter. The need is ever more urgent to build self-help, emergency shelters which can become sustainable, permanent structures and are more resistant to more disasters. The accelerating rate of disasters in the world and the historical increase in the loss of human life and property, must create a sense of urgency for the U.N. and other agencies to pay serious attention to alternative ways of building. There is a Sustainable Solution to Human Shelter, based on Timeless Materials (earth, water, air and fire) and Timeless Principles (arches, vaults and domes). Every man and woman should be able to build a shelter for his or her family with these universal elements, almost anywhere on the earth and other planets. These principles, interpreted into the simplest form of building technology have created emergency shelter which can become permanent houses, and which have passed strict tests and building codes. Since 1975 we have been dedicated to researching and developing this low-cost, self-help, eco-friendly technology which can resist disasters, and to offer it to humanity. The only missing link is to educate humans how to use these timeless techniques, developed at Cal-Earth Institute, to fit their own culture and environment. International Space University/ MIT, Boston, Mass. National Aeronautics and Space Administration/ W D.C.
California Art Education Assoc. Conf./ San Diego, Calif.
Catholic University of America/Washington, D.C.
and numerous other newspaper, magazines and online publications such as Space.com. Various Universities and Educational Galeries in U.S.